The estimable Jim Harold, host of that splendid internet radio institution known as the Paranormal Podcast, has just upped a 30-minute interview with the humble author, Jim’s first post of the New Year. Poltergeists are discussed in detail, with reference to areas such as ‘polts are demons’, ‘polts are ghosts’, ‘polts are vampires’ and such like. Yes, it’s gone polt-shaped around here. This entry was posted in Talks and Events and tagged geoff holder, interview, jim harold, paranormal podcast, poltergeist, radio, what is a poltergeist on 03/01/2013 by Jamie Cook. That gentleman and scholar Jim Harold has just posted another slice of his inestimable internet supernaturalia, ‘The Paranormal Podcast’, this one featuring my second appearance on the American show. Jim and I discuss the meaning and reality (or otherwise) of hauntings, with reference to poltergeists, apparitions, doppelgangers, fetches, and the dubious genre of ‘haunted telly’. Somehow we also managed to shoehorn in time slips (ghosts-as-time-travellers), the ‘survival hypothesis’ (ghosts-as-conscious-spirits), the ‘stone tape’ notion (ghosts-as-recordings) – oh, and some knickers. It was great fun. The show ‘What are Hauntings?’ can be downloaded for free from here! 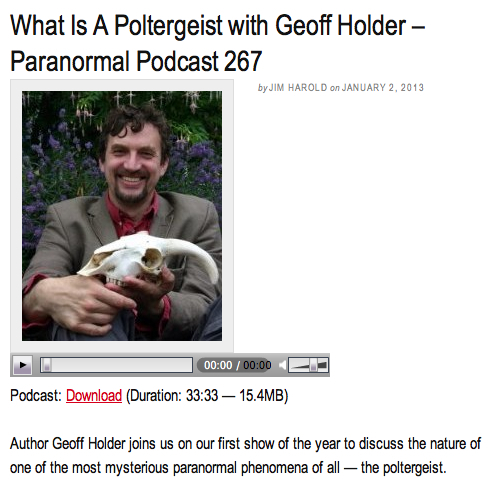 This entry was posted in Promotional and tagged 2012, geoff holder, hauntings, interview, jim harold, Paranormal, paranormal podcast, podcast, radio, show on 19/03/2012 by Jamie Cook.